It’s no secret that the liberals and the government want to take away our right to own firearms. It’s also no secret that they are threatened by ‘Right Wing Extremists’ that are willing to fight for our rights here in our country. We need to fight these leftists at the polls and take back our country. We are not the enemy here people! Editor’s Note: Despite what the government or military tell us, what you are about to see in the following video is NOT normal. Well, perhaps in 2015 Amerika it is becoming a common sight to see militarized law enforcement personnel and National Guard troops on the streets of America, but it SHOULD NOT be considered normal. Something is afoot and when we combine the overt military demonstrations taking place in our neighborhoods, such as the one you’ll see in the report from Paul Joseph Watson of Infowars below, with the coming Jade Helm 15 surveillance exercises and the scores of Doomsday Executive Actions by President Obama to prepare America for a nationally declared state of emergency, one can’t help but think that somebody in the upper echelons of our command & control apparatus thinks something very significant is going to happen. They are preparing America’s troops and police for whatever that event will turn out to be. 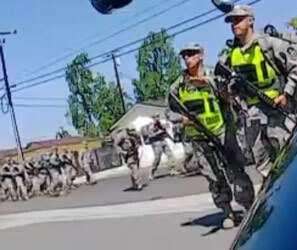 Video footage out of Ontario, California shows armed National Guard troops patrolling residential streets and practicing traffic control. The video, which was shot this past weekend, features Guard troops marching in formation while chanting a military cadence. Troops also take turns to practice blocking traffic. The troops, followed by a humvee, marched close to an elementary school and single family homes. “I just watched it again and recognized the low block wall and the elementary school! It was right there where my sister and her husband live! OMG how frightening!” one YouTube commenter responded, while others insisted the patrols were a routine occurrence. However, another respondent insisted that the patrol was not normal. Concerns about the presence of troops on American streets have heightened since the announcement of Jade Helm, an upcoming nationwide military exercise which some fear is a dry run for martial law. PREPARING FOR MARTIAL LAW- OBAMA PLANS MILITARY EXERCISES IN MAJOR U.S. CITIES! IS MARTIAL LAW IN OUR NEAR FUTURE?